Afghanistan has put on trial nearly two dozen suspects accused of involvement in the massive Kabul Bank fraud that pushed the nation's once-biggest private lender to the point of collapse. The 22 suspects include the bank's founder and chairman Sher Khan Farnoud and CEO Khalilullah Ferozi, who are accused of stealing hundreds of millions of dollars through off-book loans. The hearing, which is being handled by a special tribunal set up by President Hamid Karzai earlier this year, is seen as a crucial test of the government's commitment to crack down on rampant corruption. The scandal, which first broke in 2010, prompted the International Monetary Fund temporarily to suspend hundreds of millions of dollars of international aid to Afghanistan. 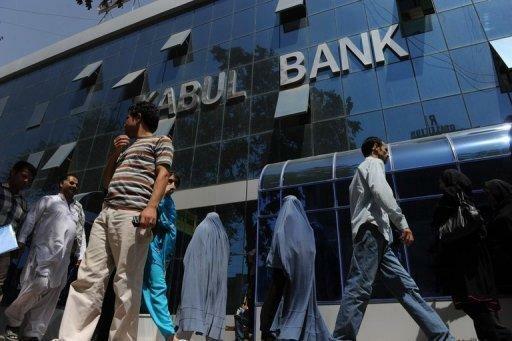 Renamed New Kabul Bank, the institution was bailed out by the government after its former bosses failed to return $900 million they had allegedly taken in secret loans. Farnoud and Ferozi first appeared before the tribunal on Wednesday, when they swapped insults and accusations over who was responsible for the fraud. On Sunday, 10 bank employees and central bank staff were accused of negligence, failing to report wrongdoing at the bank and withholding information. They denied the charges against them. One said he lacked "experience" in identifying wrongdoing at the bank. "That can't be an excuse," one of the three judges snapped. Former central bank governor Abdul Qadir Fitrat has also been charged in the case. He now lives in the United States and the court heard his denial of the charges through a state attorney appointed on his behalf. The hearing is expected to continue for a month.